Mr Zubs | In Akron Ohio! What beers do we have? A Match Made in Grub Heaven. Mr. Zub’s Deli & Bar is a unique short order restaurant with two locations (Highland Square, Kent). We are not an ordinary sandwich and pizza shop. We go heavy on the quality meats and fresh veggies. Our pizza is high quality and our wings are amazing. We grill our sandwiches and build them just the way you like them. Our menu is large – just like our award winning food. We name our sandwiches (and soon our pizzas) after some of our favorite movie characters. Our best seller, THE ROCKY BALBOA, is our classic grilled Philly Cheesesteak. The UNCLE RICO is a mound of hot, grilled roast beef with onion & chive cream cheese topped with tater tots, naturally . Yes. We put tots on the sandwich. So yes, meat eaters love us. You Brontosauruses love us, too. We carry many vegetarian and vegan items. For example, try our MARGO TENNENBAUM. It’s a pita filled with homemade hummus – the authentic Lebanese kind – cucumbers, and radishes. We also now carry signature pizza, wings and broasted chicken. What else could we say that tops everything we just mentioned? BOOZE. We have a full service bar with many classic cocktails as well as over 20 drafts in our Akron location. – If you are near Kent, Ohio, you can visit Mr. Zub’s Deli inside The Water Street Tavern. Sit down at the bar…order a drink…then a sandwich, pizza and wings. Repeat. you're not going to eat that sandwich by itself, are you? Yes, we can cater that for you. Let us bring Zub’s flavor to your office, your next corporate event, or your party. Mr. Zub’s has a wide array of food to choose from. We also are extremely unique by offering our regular menu as well as our catering menu for business deliveries or business functions. To place an order for business delivery or any catering, please call 330-252-0272. 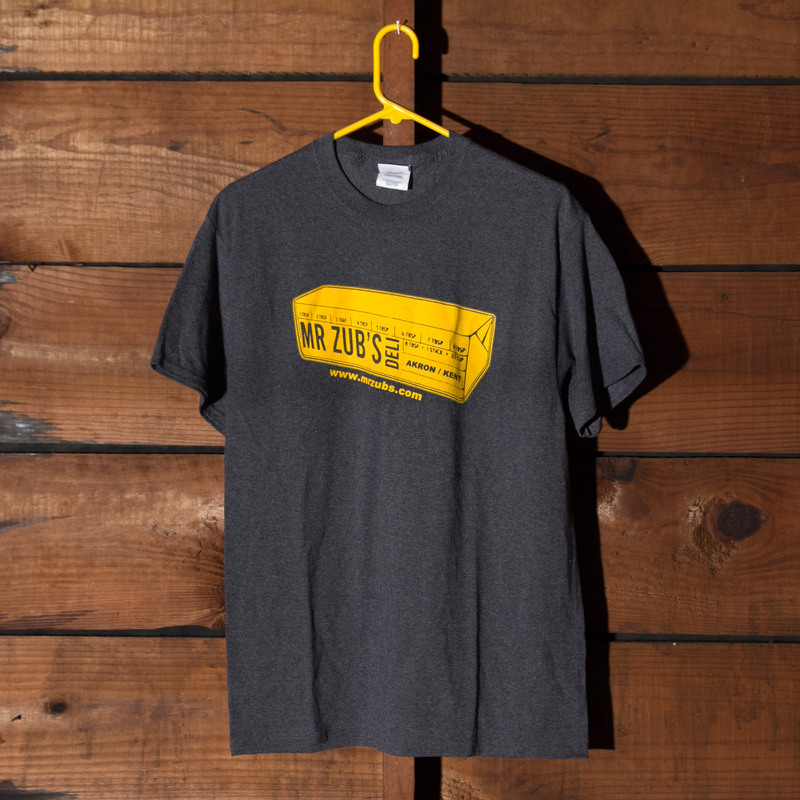 A t-shirt that fits and shows off your favorite local sub shop.